Miami (CNN) -- Hurricane Katia weakened to a Category 2 storm Tuesday as it churned in the Atlantic Ocean, forecasters said. As of 8 p.m. ET Tuesday, Katia was about 335 miles (540 kilometers) south-southwest of Bermuda, packing maximum sustained winds of 105 mph (165 kph), according to the Miami-based National Hurricane Center. The storm was moving northwest at about 10 mph (17 kph). The Bermuda Weather Service issued a tropical storm watch for the island, with tropical storm conditions possible within 48 hours. Up to 2 inches of rain could fall across Bermuda, the hurricane center said. The storm is expected to stay away from the United States. 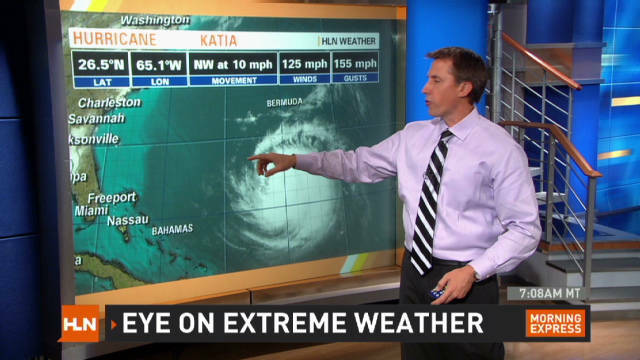 The front moving the remnants of Tropical Depression Lee up the East Coast is anticipated to help keep Katia offshore, according to CNN's weather bureau. "On the forecast track, the core of Katia is expected to move over the western Atlantic between Bermuda and the East Coast of the United States," the hurricane center said. "Eventually the hurricane is going to turn toward the north and northeast away from the U.S. coast. We are becoming more confident of that," said Todd Kimberlain, a forecaster at the National Hurricane Center. However, the storm is expected to produce large swells, heavy surf and rip currents. "There might be 10- to 12-foot breakers," Kimberlain said. "These swells will affect much of the Eastern Seaboard of the United States and then down into the Bahamas." Besides the U.S. East Coast, the swells are expected to affect Bermuda and the Greater Antilles, along with eastern Bahamas beaches, the hurricane center said. "These swells are likely to cause life-threatening surf and rip current conditions," it added. Hurricane-force winds of at least 74 mph extended up to 80 miles (130 kilometers) out from the storm's center. Katia's tropical-storm-force winds -- blowing consistently at between 39 and 73 mph -- extended outward up to 205 miles (335 kilometers). Some fluctuations in Katia's strength are expected through Wednesday, followed by gradual weakening, forecasters said. CNN Radio's John Fricke contributed to this report.